Sorry for the lack of posts, but just wanted to write a quick recap of my run in last Sunday’s Philadelphia Marathon — my second marathon, both all-time and this year. As you may recall, I was disappointed in how I finished my first 26.2-mile race, the 2017 New Jersey Marathon held last April. I had estimated the Sport Beans fiasco from that race cost me a good 30-45 minutes. I definitely knew I should have finished in under 5 hours. So…let’s start at the beginning. First of all, overnight rains stopped not too long before the 7 a.m. start of the race. But in its wake were strong 15-20 mph winds with up to 45 mph gusts — and overnight temps near 60° F falling into the upper 40s during the race. This meant wind chills in the lower 40s. Ordinarily, that would be pretty comfortable running weather, but the wind was a bit of a wild card and it affected my strategy. For my first marathon, my goal was to run a sub-hour 10K and then gradually gear down to a 12:00/mile pace for the next 15 miles or so, which I did before running into trouble around mile 18. This time out, I wanted to try to run at an even 10:30-10:45/mile pace throughout. But I knew most of the first six miles were going to be with the wind at our backs, so I made a starting-line decision to push it a little more when I could use the wind to my advantage. 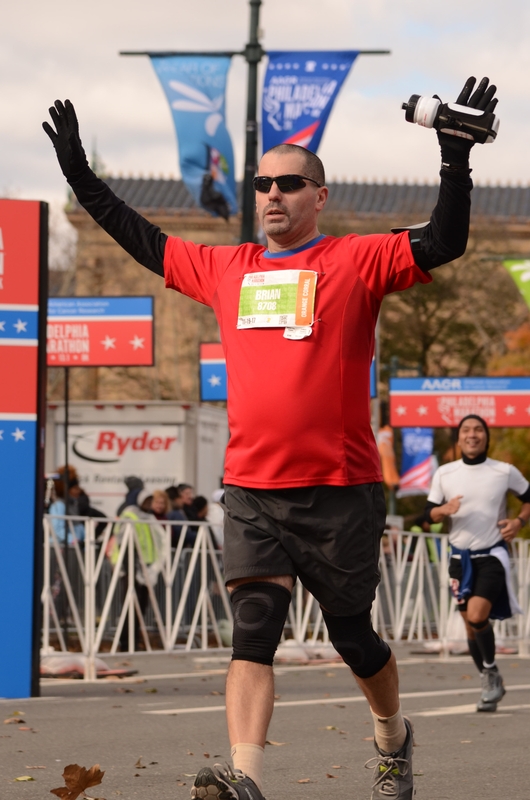 Even though my first 10K (1:00:38) wound up being 39 seconds slower than my New Jersey Marathon 10K split, I hit the halfway point of the Philly Marathon (2:10:23) about four minutes faster than I did last April. Again, I was right where I wanted to be — actually, better than where I wanted to be. But then the race reached Kelly Drive, which we took along the Schuylkill River into the party neighborhood of Manayunk. This is where you could see the front of the pack making its way to the finish line down the other side of Kelly Drive. And even though the wind was in our faces, you could see the fallen leaves blowing into the runners going the opposite direction. This meant the wind was swirling so I could tell around mile 15, the wind was going to be an issue for most of the next 11.2 miles. At that point, I just decided to keep going as hard as I could and take it super-easy the rest of the way. I figured there was no point in fighting the wind. Instead of walking for three miles straight (like I did in April), by mile 19, I wound up — generally speaking — walking for five minutes then running for five minutes or so over the final 7+ miles. Since the Philadelphia Marathon utilized a real-time race-tracking app called RaceJoy, which could tell me anticipated finish time at each mile, I knew when I reached mile 24 that I was going to finish in less than 5 hours, even with the walk/run plan I was doing at that time. I decided to walk most of mile 25 and just run it out the last 1.2 miles. And that’s what I did, and finished in 4:51:22 — a little more than 23 minutes better than my previous marathon. Considering the elements and the fact that I hadn’t trained nearly as much as I would have liked, I was much happier with this effort. Oh, and I forgot the most important part…I discovered something I could ingest mid-race for nutrition that wouldn’t screw me up — squeezable apple sauce! Screw you, Sport Beans!